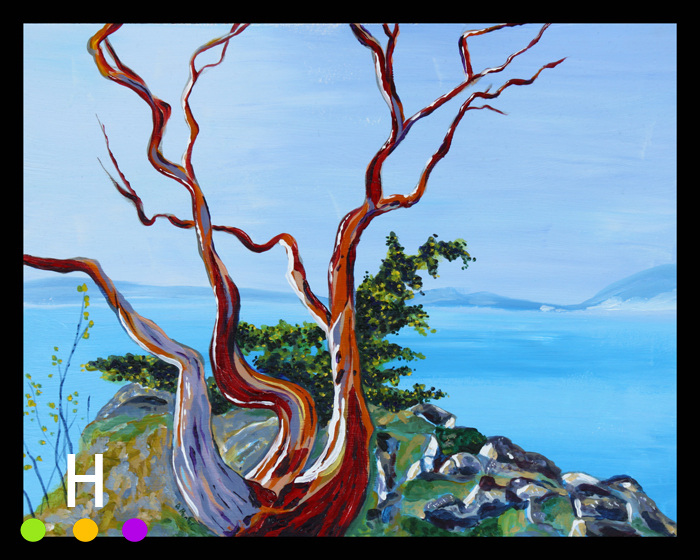 “Welcome Bay Arbutus” is another of my Pender Island paintings. This is a quiet little bay on North Pender Island and depicts a day, one November, that was cold, wet and foggy……what our family refers to as “it’s west-coasting outside”. Wellie weather. 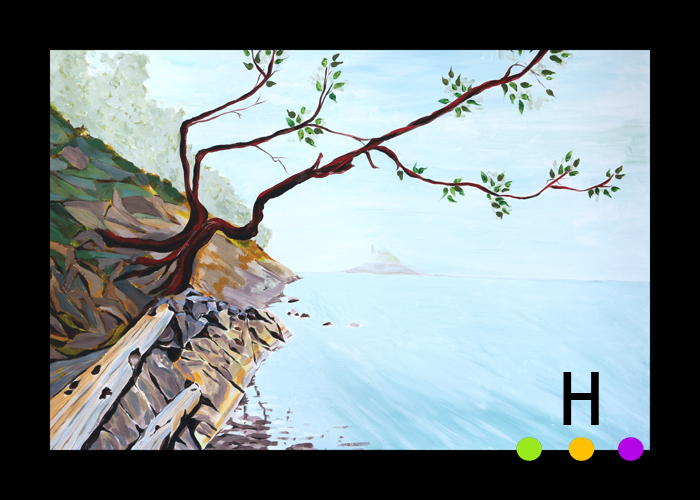 “Welcome Bay Arbutus” is finally finished after two years of working on the canvas sporadically. At three feet wide it is one of my favorite sizes of canvas to paint on. Working for such a long spread out time on this canvas created some interesting situations. First, I had to keep reminding myself what it was that first attracted me to the subject matter and what I wanted to present. The second thing that was tricky was keeping the style the same over the course of time. Last week I discovered that the painting looked like it had been painted in three different styles in distinct zones. One area I have no idea what I was originally thinking….apparently a sponge was handy and I used it (a lot!). The only way to solve the “three style” painting was to completely attack the areas that did not work, ignore what had been done in the past, and paint as if I was painting by scratch. In the end it all worked out and I am really happy with the piece. 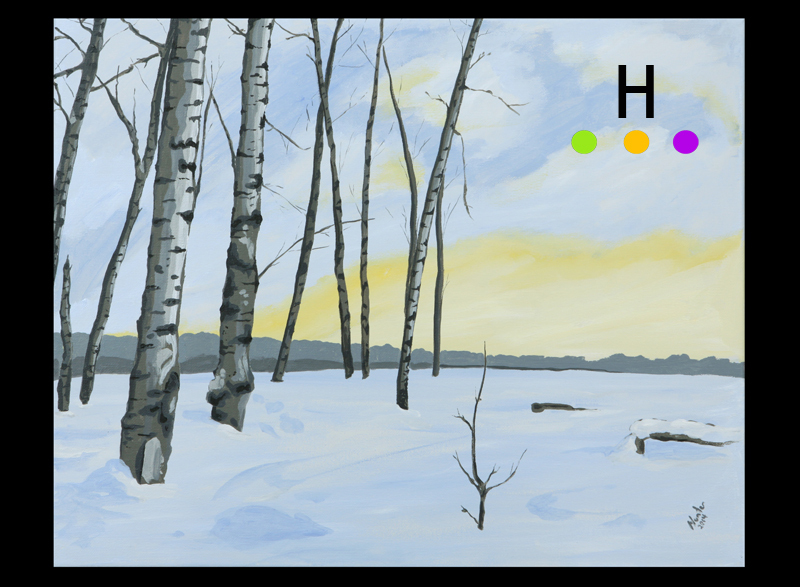 “Deep Snow in the Sanctuary” is a painting depicting an area I visit often in the sanctuary area behind Kerry Wood Nature Centre in Red Deer, Alberta, Canada. A few weeks ago I was snowshoeing past this spot and the trees caught my eye, perhaps because it is an interesting view, but also because it reminded me of a painting I had just completed, “Cabin Trees #1”. I took a quick iPhone shot and was on my way. A bit later I was looking at the image and thought it was worth a painting. This is literally the first landscape painting of Alberta I have done in years, with the last several years being focused on painting macro images of wild and garden flowers. It was interesting working on a full view compared to working on macro subjects. It was refreshing really. When working up close every inch is filled with some detail, while on a landscape part of the story is the empty space. Viewing the canvas in person really gives the feeling of quiet winter space; an experience that an image on a computer, tablet or phone just can’t quite convey. I’m quite pleased that I stopped to take the iPhone shot as it has made me expand my horizons. I am now thinking I should use the sanctuary as a basis for a theme for the next little while. It is an area close to home, an area I know very well, and it will give me the opportunity to mix landscape while still dabbling in a few wildflower macros. It also gives me a very good excuse to get out and snowshoe and walk more often…..and that is a very good thing! This is a painting that sat on my easel for months half-finished. I walked past the unfinished canvas hundreds of times, thought about what I should do next, but never put paint to canvas. The other evening I had an hour and a half with no one else in the house and decided it was the perfect opportunity to get a little bit done on the painting. Finishing off the painting came incredibly easily, probably because I have photographed and sketched these trees numerous times and by doing so I knew exactly what it was I wanted to show of the trees. I wish all paintings went this way. The painting is called “Cabin Trees #1”. These are the trees that sit in the backyard of our cabin at Lake Isle, Alberta. I like the muted color and the patterns on the trees, but most of all it is the subject matter that draws me to the painting. The painting is a glimpse of rural Alberta, but also transports me to our cabin.